I’m going to take some time to share with you ALL the projects completed for last weeks challenge. Since there is no ‘Public Vote’ this season, I don’t have to do them all in one post – in fact, since there were so many I’m probably going to do it in about 6 or 7 parts. 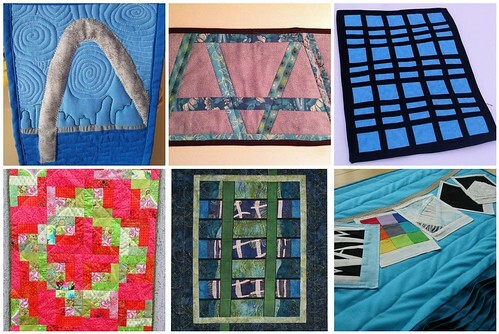 I hope you enjoy these quilts and as your looking at them and reading there story – remember, these were all created in just ONE week! Bravo to everyone! The second challenge will be posted next Sunday, January 22nd at NOON! 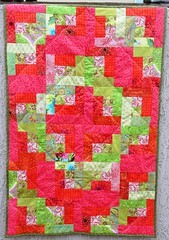 Sign up for my newsletter and/or like Project Quilting on Facebook to ensure you don’t miss out on the fun! I just found Project Quilting and am so glad I could jump right into the first challenge! When I started thinking about architecture, my first thought was Roman Architecture. So I began googling. I found tons of pictures of the Roman arches and they're lovely. 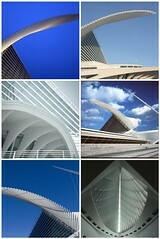 But those pictures led me to think of the St. Louis Arch which I have visited many times. And why not make it personal? :) It is such an amazing structure. 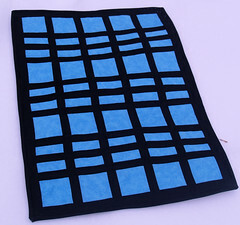 My project is a 7"x9" hot pad (potholder). We can never have too many! The piecing is very simplistic, it's the free motion quilting that I feel makes it pop. The 4 fabrics and 4 different threads were all stuff I had on hand, so a zero cost project... my favorite kind! This really threw me out of my comfort zone and I feel like I created a piece of art. So happy to be participating this time around! There's an old iron bridge less than half a mile from our house that has turned green with age. I decided to make a free-form version using only scraps. I pulled from 1.5" strips to get the bridge pieces, and used a random piece of grey dot that seemed fitting giving how grey the day was today. Even the binding was a scrap- left over from a baby quilt I made last year, and magically just enough for this elongated mug rug! It will be perfect for the table behind me while I sew, so I can set my mug of tea (and a snack or two!). It measures 9" by 16.25"
Created in North Central Illinois. The size of my piece is 21" x 29 " and was inspired by the brilliant sky blue glass and window layout from my inspiration photo. 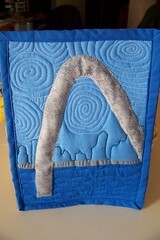 My project was machine pieced and then quilted in the black sashings. My choice for this challenge is either a cop-out or brilliant. I vote for the latter! It is certainly brilliant in the color choices I worked with. All fabric used is from my stash, so it has a zero budget assigned to it. 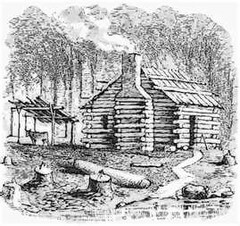 The layout is 'barn raising' another pioneer symbol. This 30x44" lap quilt will be donated to our Veteran's hospital here in Tucson, Az, where it was made. I hope these happy colors will help to cheer up and bring a smile to its new owner. 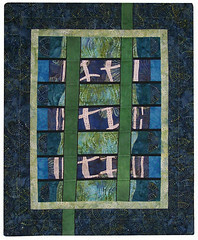 Made by Pam Geisel of For Quilts Sake in Yellow Springs, Ohio, Jan. 2012 for Project Quilting Season 3, Challenge 1, Architectural Elements. The last few years we’ve spent some time traveling and I noticed that I was drawn to interesting architecture. So much that I took several photos of buildings because I thought they’d make interested quilt ideas. So when I saw that the first challenge for this season’s Project Quilting was Architectural Elements, I immediately started looking through the photos I took. We’ve recently been to Atlanta, Knoxville, Louisville, San Francisco, Portland, Seattle and places in between. 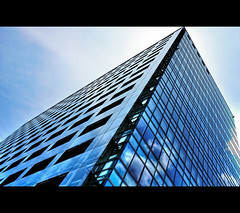 The photo I decided to use for this project was taken in the Financial District in San Francisco. I was really interested in how the windows of the building reflected images from the building across the street and it appears that the even-numbered floors are reflection from one angle while the odd-numbered floors are reflecting a different image. Since the photo is fairly abstract, I wasn’t trying to recreate in exactly. For one thing, there’s not a lot of color in it. And there aren’t any reflections on the far right side. I wanted this quilt to be more symmetrical so I decided to include the reflections on that side also. To give you an idea of the scale of this quilt, each window is 2.25” high. I decided to create the larger, lighter shapes in the windows by cutting out light-colored fabric and fusing them to the background but I didn’t want to have to do that with the smaller reflections. Instead I looked through my batik fabrics to see if I could find one with a pattern similar to the one in the photo. I found one that I thought was a good fit and it’s green with some blue in it. I also found some other batiks that complimented the green one. The windows aren’t exactly straight and I wasn’t sure I could piece the subtle angles so I got a piece of fabric and set the batik fabrics on top of it, fusing and stitching to hold them in place. Black bias tape fabric was used to cover the seams. At first I thought I wanted to do the whitish columns in a light color but once I started to work with the fabric, it didn’t look right to me. I wanted fabric that would be strong enough to support the design element but not stand out too much. I literally took out every piece of batik fabric to see if it would work and nothing really did. Then I remembered that I had some hand-dyed fabric and found the green piece which did work with the other fabrics. I pieced the two borders, added some black cording on both sides of the green columns then for the binding I used a strip-facing technique. "A view from Lake Michigan"
I have always loved the angles and design of this building. When I look at it through a quilter's eyes, I see lots of pleats, thin and thick, and some tapered. For PQ, I always enjoy trying new techniques, so the ones that I focused on here were pleats! I've worked with undulating pleats before, but never thin ones or tapered ones. I also like the way pleats add a 3D element to working with fabric and maybe help my architecture piece come to life. Therefore, I knew that I wanted to try and work with pleats. I decided that I wanted the wingspan and interior ceiling to be my focus, and that I would frame these in Polaroid pictures. I love that Polaroid's capture one moment in time that cannot be recreated (vs. film with negatives). Each Polaroid captures the following (from L to R): MAM- the initials for the museum framed in blue since the museum's colors seem to be white and blue, Polaroid logo, wingspan, blank Polaroid, and interior of museum. I used edge-turned appliqué to layer the Polaroid's. This was also another new to me technique. For the wingspan, I used narrow pleats with some tapering added at the end, and for the interior, I used tapered pleats. 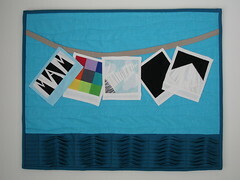 At the bottom of the quilt, I made undulating waves to symbolize Lake Michigan. All the Polaroid's dangle above it because it reminds me of a clothesline on a summer day, which is when I most often tend to find myself there! 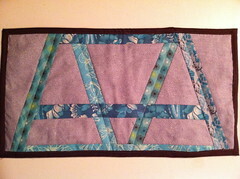 Finally for quilting, I used organic lines-- keeping with the wavy nature of the lake and/or breeze in the air. The quilt is 17x21 and I made it in Milwaukee, WI. I finally got to view all of them on Flicker last night! This is also a nice way to highlight the projects! They were all wonderful! So many creative ideas! I'm kind of glad there aren't judges/voting this year...there are so many great quilts! It would be hard to pick one favorite!